I’m about to finish up the first draft of my manuscript and send it off to my editor. Not write what you know. Write what you like. Back in the 90’s when I was first starting to make 4-track tapes I had a game where I would make a fake version of an album I was anticipating. If Pavement’s Brighten the Corners were (sic) coming out soon, I had to wait till release day to hear it. I would record a set of songs that I would want the Pavement album to sound like. Some of those songs ended up becoming Atlas Sound and Deerhunter songs years later. My advice to those who are so desperate for AC’s album to leak is to pick up instruments and make your own version of what you would want it to sound like. Respect the BANDS wishes and wait till release day. Then you can compare your new songs with theirs. Who knows. Maybe your album will be the one people are wanting to leak next year. I’m reminded of the last Dirty Projectors album, where Dave Longstreth found an empty cassette case of Black Flag’s Damaged and recreated the album from memory. The manifesto is this: draw the art you want to see, make the music you want to hear, write the books you want to read. Bravo! I concur with your manifesto. 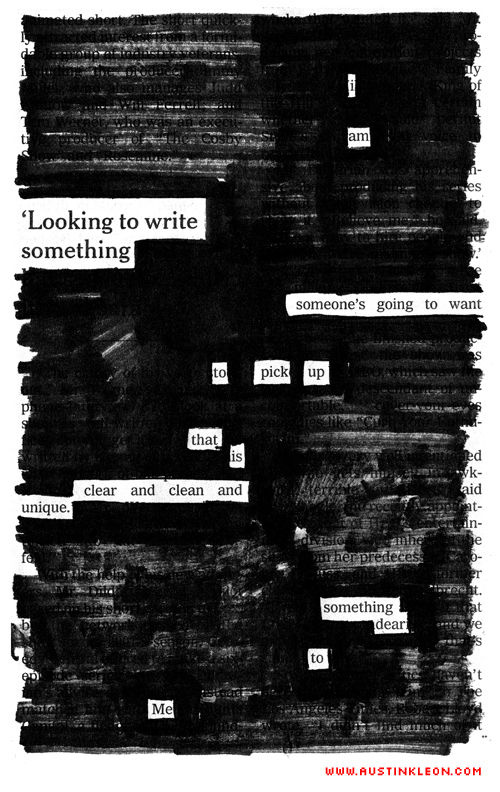 And I LOVE the new poem (“I am looking to write…”)! Thanks for the continued inspiration, Austin. What an excellent manifesto! I can only write the words I want to read. I’m in the middle of reading David Jauss’ “Alone with All That Could Happen” (essays on fiction and writing), and one of the best essays I’ve read so far is about how he explores characters that he does not know “in real life” but that writing allows him to dive into their world. I think “write what you know” is advice for the easy way out. I like it. It makes me think. “What is it that I want to read?” Thanks. that “were” is the subjunctive, not a mistake. gosh.